Sometimes you come may acrosss a situation where we want to have more options on a particular page in ionic app, that's where ionic Popover come's into action, Popover is a dialog that appears on top of the current view. It can be used for anything, but generally it is used for showing options on top of present view if options does'nt fit in the navigation bar. In this post i'm going to take you through, on how to integrate basic Popover in your ionic application , pass data from present page to Popover and also capture data from callbacks when popover is dismissed. Once the page is created, Open presentpop.html file in presentpop folder. Copy and Paste Below html in presentpop.html file. Now, Open presentpop.ts file in presentpop folder. Copy and Paste Below code in presentpop.ts file. Now, lets create the popover template. Once the popover page is created, Open popover.html file in popover folder. Copy and Paste Below html in popover.html file. Now, Open popover.ts file in popover folder. Copy and Paste Below code in popover.ts file. The presentPopover($event) method is the one which initializes the popover. the $event parameter helps in positioning the popover on the clicked area. the above line creates a popover using Popover.html and also sends "listData" data to the respective popover to display as list. once the data is send to "PopoverPage", the data ie "listData" is to be displayed as a list in popover. to do that we should first fetch the data that is sent from "PresentpopPage". this can be achieved by "NavParams", ionic NavParams catches helps in fetching the data from other pages from which the present page is launched. below code fetches the data from "PopoverPage". Once the Data is fetched the variable containing the fetched data, is used in *ngFor to loop data. 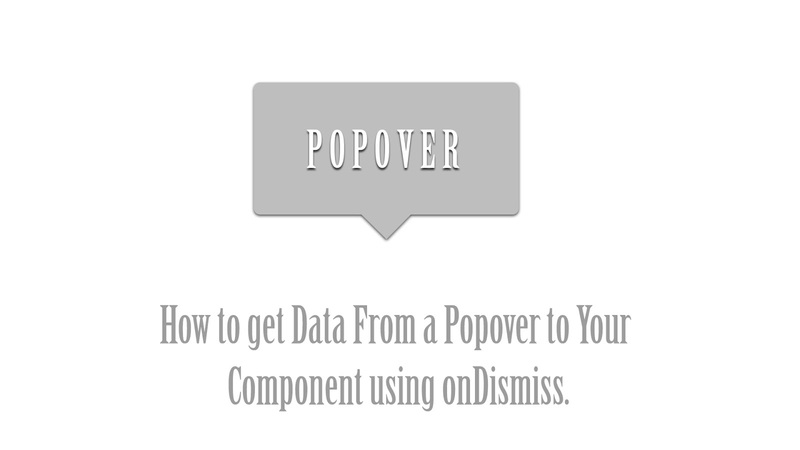 the dismiss() method is used to close popover. viewCtrl.dismiss method will close the popover, and also sends provided data as callback to the parent page from which the popover is launched. ie in our case "PresentpopPage". The data that is send as callback, should be fetched right?. 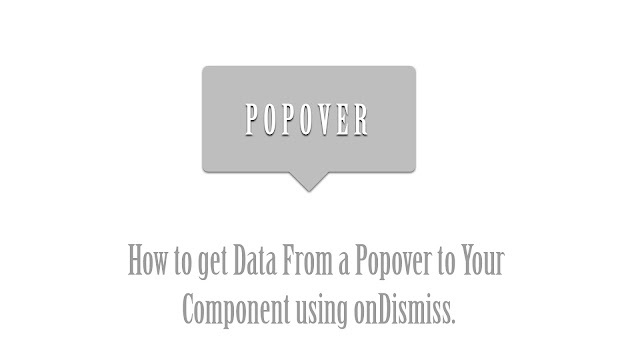 onDidDismiss() function of Popover catches the callback once the popover is dismissed. the fetched data is assigned to "selectedData", you can see that the data changes when item is selected in popover on the browser. Hi, I tried using the above code for the popover function but I am getting errors. The error says that it is unable to create a popover page. Can u please help me on this. It's urgent !